Housing affordability across Canada continues to erode, at least according to the National Bank of Canada and their latest affordability study released earlier this week. Per the National Bank of Canada, the rise of borrowing costs did not prevent a further sharp rise of prices in Vancouver, inching up 2.7% quarter over quarter (seasonally adjusted), leaving this market less affordable than at any time since 1980. The bank echoes recent findings that the mortgage stress test is starting to bite. With borrowing power being slashed by roughly 20%, the maximum loan amount is down to where it was in 2011 even though interest rates are now 60 bps lower and incomes 17% higher than they were then. Also concluding that about 10% of recent mortgage applicants for uninsured loans would have been disqualified under the new rules. While this may be discouraging for many Vancouver homebuyers, the old saying “the cure to high home prices is higher home prices” appears to be playing out. The reality is with housing affordability stretched to its limits it has drastically reduced the buyer pool. Many applicants, who either no longer qualify, or simply can’t purchase the home they want at current inflated housing prices, have moved to the sidelines. The National Bank of Canada finds seasonally adjusted home sales dipped to a five-year low in Vancouver. And even worse in the city of Toronto which recorded a 10 year low in the first quarter of 2018. With sales grounding to a halt, sellers are facing pressures to slash asking prices. Particularly in the detached housing market where sales fell to a 30 year low in the city of Vancouver for the month of April. The median home price across all dwelling types now sits at $1.089M in Vancouver. Which would consume roughly 80% of the typical income in Vancouver and require a qualifying income of $191,892 under new regulations. With affordability stretched to its outer limits it should come as no surprise that CIBC one of Canada’s largest players in the residential mortgage space expects new mortgage originations to decline by roughly 50% in the second half of this year. 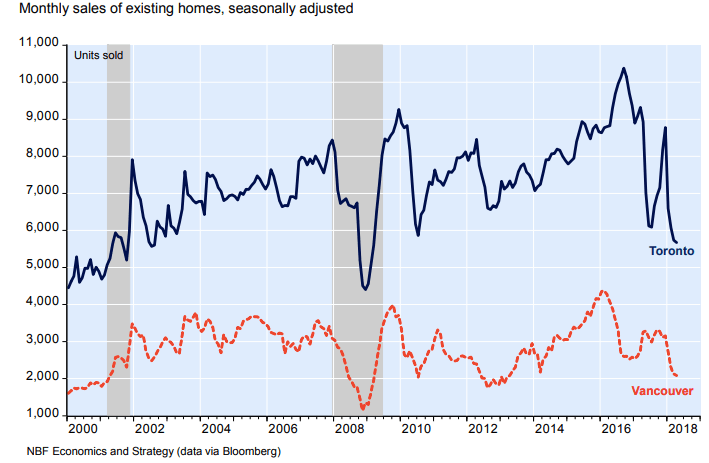 Further the slowdown can be reflected in the balance of residential mortgage credit where the 3-month annualized trend is now at the slowest pace of growth since 2001. 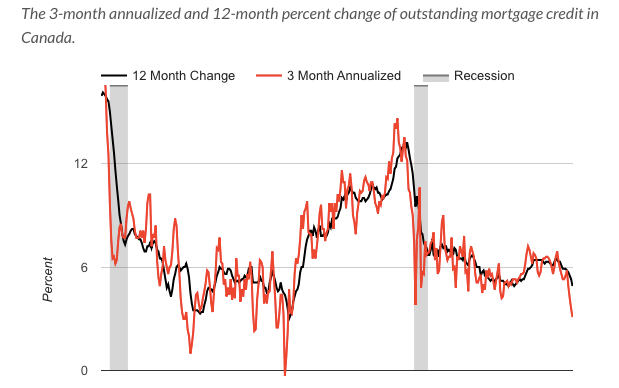 Growth slid to 2.2% in April, a 53% decline compared to the same period last year.